He squatted, waiting tensely but patiently, and then seeing the right moment, he snuck the 9-inch blade under the armpit and into the heart, and withdrew it immediately. The pig reeled and squealed, but within 10 seconds, it was on the ground, the rope around its neck and snout went slack, and he snorted one last time. The two men quickly stepped in, grabbed its legs, heaved it into a wheelbarrow, and walked briskly off to the cleaning station. The transformation from pig to pork had begun. 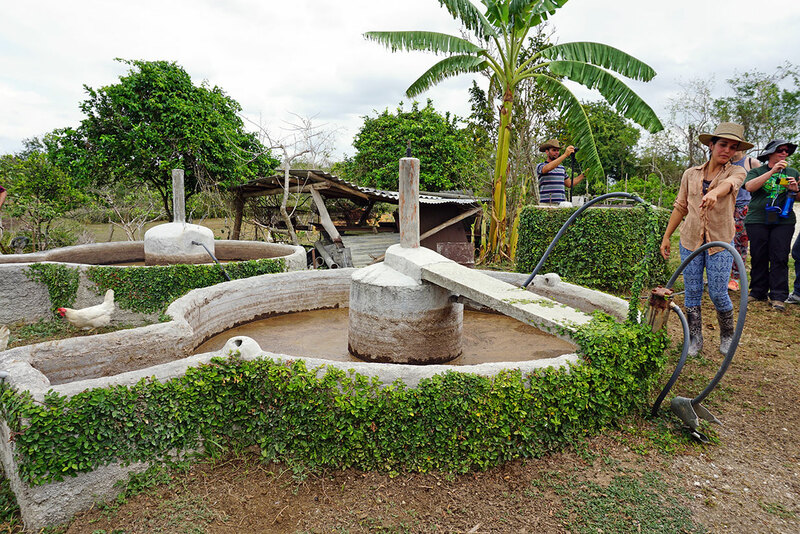 A biodigester is one of the sights at the permaculture farm Finca del Medio. Visitors are guided by the founder’s daughter, Leidy Casimiro Rodríguez, who holds a doctorate of agroecological sciences. We students and instructors had traveled from the throes of a frigid Vermont winter to the warm Caribbean island country of Cuba. The slaughtered pig was to be the focal point of a celebration to mark our third and final night visiting a sustainable farm in the Sancti Spíritus province of Cuba. We were here to study Cuba’s legendary agroecology practices. This particular farm uses a system of agriculture that is at once sophisticated and basic. Farmers apply their complex understanding of crop rotation, integrated pest management, and natural soil additives; and yet manage and harvest these crops with minimal external inputs or machinery. The origin of these techniques in this place arose not from ethics or the efforts of tree-hugging hippies, but from heart-breaking nationwide desperation. Let’s back up for a second. In the early 20thcentury Cuba—specifically the colonial city of Havana—was an international party spot, offering the perfect combination of sun, beach, and exotic otherness only 90 miles from Key West. It became hugely popular with a rising European and American elite. In 1929 the ritzy Havana hotel Casino National advertised only “39 hours from New York” by luxury boat. By the 1940s, Havana was a hotspot for American bad boys (and girls), famously spotlighted in the 1946 Havana conference, where more than 20 American mafia—and Frank Sinatra—partied and planned at the Hotel National. But by 1959, unrest that had been roiling just under surface erupted into revolution, resulting in a bloody power transfer to Fidel Castro and his socialist regime. As the United States severed all ties with Cuba in the 1962 embargo, Cuba turned to the Soviet Union as a primary trading partner. Cubans began driving Soviet cars, pumping Soviet fuel, and putting Russian fertilizers on their crops. In the mid-1980s, the Cuban economy was based on sugarcane, coffee, and tobacco, all of which were heavily reliant on agricultural inputs from the Soviet Union. Then the Berlin wall fell. Overnight, the faucet was turned off. Cuba was left without their major trading partner, and their economy—and agricultural system—spiraled into crisis. Suddenly, no gas. No food. No tractor parts, herbicides, or fertilizers. The average Cuban lost as much as a quarter of his body weight in what Fidel Castro was to term “The Special Period in a Time of Peace.” So Cubans did what they must: they adapted. Those we met who were adults during the Special Period are fiercely proud of this collective ingenuity from desperation—even though when they speak of it, their deeply-creased brows and distant gaze hint at a dark personal story. In the agricultural world, practices were utilized which did not require chemicals and farmers turned to animals instead of tractors for plowing. Many of these practices are still in use, visible today on the farms we visited. Cuban tourism has also adapted from the era of luxury liners and mobsters. Though tourists from Canada and Europe have been coming all along, once-nominal American tourism picked up in 2015 as the Obama administration began normalizing relations between the two countries (Trump policies have since rolled this back). Indeed, tourism has been seen as a major growth sector there for nearly a century; even as early as 1929, travel author Basil Woon predicted that “Fifty years from now … The salvation of [Cuba] will no longer be tied to a sweet reed. Diversified crops and, above all, the tourist business, will have wrought the change.” But is tourism really Cuba’s “salvation”? Will increased tourism help or hurt this place? Modern tourism places heavy demand on resources. In a place with limited fresh water, think of all those toilets flushing and bedsheets washed. Cuba’s mighty coral reefs are vulnerable to careless fin strokes and globs of sunscreen. The energy grid is humming to provide every hotel room with air-conditioning in a tropical climate. And so there I sit, a northerner wondering about how many of us this island can handle, all while chowing down on that exquisite roast pig. I join many of my fellow students in this pork enchantment as we scarf up ribs and crispy skin. “This is the best pig I’ll ever have!” “I’m on a meat high!” The feast is for the entire small agrarian community, who join us after their work day. Several are experienced musicians, and they meander effortlessly between popular Cuban songs to Buena Vista Social Club, to Guantanamera, to American tunes, while the fearless dance atop the picnic tables. This scene is an integral part of the farming community’s lives, and they are, at least for now, proud to share this tradition with tourists who are desperate for the authentic experience. As we depart this farm the next morning, we are a bit misty-eyed recalling all those meaningful conversations and laughter, and wave goodbye from our old yellow school bus. “So great!” that was, we say to one another, and head to our next stop on the island. And so this fills my mind as we head to the beachy resort town of Playa Larga. Even though we meet some wonderful people here too, it feels less authentic. Maybe it feels that way because we see foreigners everywhere, and indeed this town is growing to accommodate the tourism industry. We know at our first meal even, when we spot hot sauce on the table: it’s a rare Cuban who likes spicy food. We know when we order our mojitos, sipping them even as we acknowledge that they cost a quarter of a Cuban’s monthly salary, and so the locals rarely drink them. 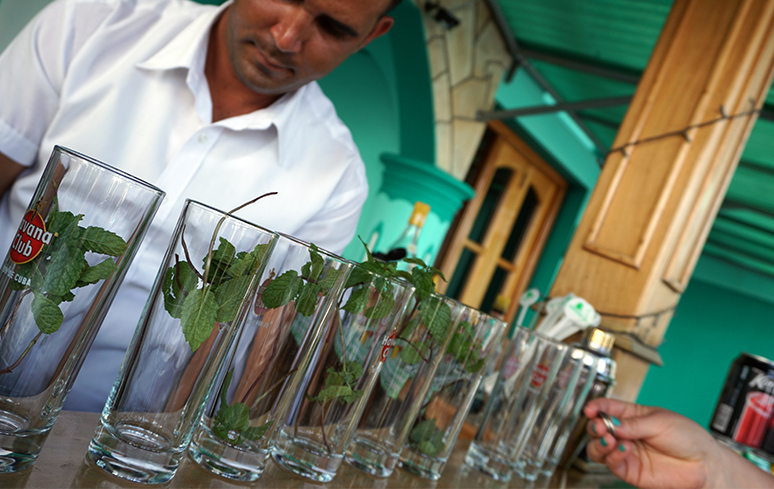 Tourists at the Cuban beach town of Playa Larga flock to bartenders like this one preparing mojitos with local Havana Club rum. How does a thinking feeling tourist accommodate this mix of excitement, guilt, concern, and pride? Our academic mission gives our Vermont group access to people and places off the beaten path, but nonetheless like the quantum observer effect, our presence is changing this place. Some say, “How great you got to Cuba before it is spoiled!” and indeed it sometimes feels that way, as I snap photos of my new friends on cobbled streets next to old cars. But only the nostalgic narcissist would wish that a beloved place be stuck in time. Cuba is growing and changing—with or without tourists—and it would be profound hubris to think the Cubans can’t see it coming. The Cubans are experts at adaptation and resiliency. Even as I write another change comes: Miguel Díaz-Canel is being ushered in as Cuba’s new president, the first time in 42 years a Castro will not be in power there. I think often of that farm. After we departed, those farmers cleared the tables. They washed the dishes. They prepared for another group to arrive, maybe Korean, or Australian, or Canadian. Together, they had meaningful exchanges of laughter and ideas, talked about Cuban agriculture, and shared roasted pig. But how many times can this remote farming community—or Cubans anywhere for that matter—welcome tourists into their hearts before it becomes a performance? Is it already? -Sarah Lyman Tichonuk is an assistant webmaster with UVM Extension, a master’s student studying data visualization in UVM’s Food Systems program (2019), and a life-long traveler. She traveled to Cuba with the graduate agroecology course “Cuba: Ridges to Reefs,” one of the many study abroad programs offered at UVM. Tags: agrocology, Economy, food culture, UVM. Beautifully written essay on both your experience and the dilemma posed to countries/communities where tourism can simultaneously promise economic benefits and also bring cultural change.